I saw an ad for the fully loaded nachos and I was stoked. I love nachos. Who doesn't? No need for a fork or a plate. Just take the lid off and dominate. Double the beef, guac, fiesta salsa, sour cream, tortilla strips, nacho cheese, shredded cheese, beans, jalapenos and the whole thing is seated in a big taco shell. So, I went there and ordered it. Found out you have to pay extra for jalapeños. Bummer! Got home to enjoy my prize. The box it came in was ENORMOUS. Opened it up and what a mess. 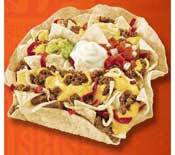 I don't expect the people at taco bell to be artists, but all the toppings were just slopped in so haphazardly. It would be have been fine if they were piled in layers, but these were sectioned off. Getting a decent bite required a lot of effort on my part. I had to take a chip and keep dipping it into the different subsections of the pile. The sour cream section on the upper right, the beef section in the lower left, the bean section in the upper right... you get my point. The whole thing was a total mess. On top of it, the guac tasted very strange. Sort of like what I would imagine that ninja turtle mutagen tastes like. And the shell, YUCK. I'm pretty sure it was supposed to be edible, but it tasted like cardboard. You would be better off eating the brown napkins they have there. Avoid this item and stick with the classic nachos bell grande! hm. i doubt it tastes very bad at all. and i don't think you can knock points off for it being divided in sections. also comparing the shell to cardboard, what does that mean? something tells me this tasted kinda OK. I had these yesterday and it was shite! After finishing I immediately started to get a migraine. Awful food, truly awful. I have sworn off Taco Blah. I had them once before. They aren't great but they aren't terrible either. They taste like something a 15 year old kid would make if he/she had fresh ingredients and just started cooking like a month before. I've had worse and I've had better. I'd give them a 6 on a scale of 1-10. I agree the quac is crap, but I actually really enjoyed these nachos. I think if they were made properly you would have given them a better rating. I know I would have given them that green radiant smiley myself haha, whats there not to love, you have chips inside a bigger chip. Great blog man. Great review dude! Now I know what to avoid when I want the ol Taco Runs! to tell the truth , i think this is a bad revue i personaly think the shell tastes just like the rest of the chips . The rest is aussom also. i have never been dissapointed from taco bell. The other restarants have. So i do not see why the one you went to "sucked" so to speak.